An eye-catching envelope stands out and makes people want to open it to see what's inside. 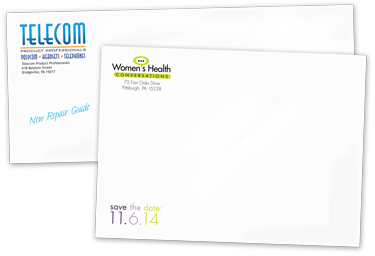 Take advantage of our full color envelope printing to really get your envelope noticed. Banksville Express also offers 1 and 2 color printing as well. From business to announcements, we do it all. If you need to customize each of your envelopes with the recipients' addresses, Banksville Express provides variable data printing services. Create a stationery package complete with letterhead and business cards.